Mysterium Coniunctionis was first published in the Collected Works of C.G. Jung in 1963. For this second edition of the work, numerous corrections and revisions have been made in cross-references to other volumes of the Collected Works now available and likewise in the Bibliography. 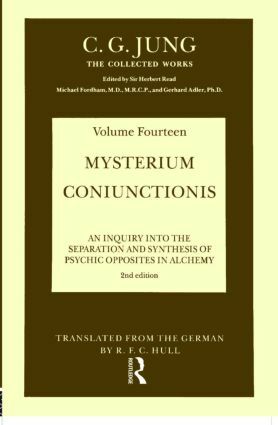 Mysterium Coniunctionis was Jung's last work of book length and gives a final account of his lengthy researches in alchemy. It was Jung's empirical discovery that certain key problems of modern man were prefigures in what t he alchemists called their 'art' or 'process'. Jung maintained that 'the world of alchemical symbols does not belong to the rubbish heap of the past, but stands in a very real and living relationship to our most recent discoveries concerning the psychology of the unconscious'. The volume includes ten plates, a Bibliography, an Index, and an Appendix of original Latin and Greek texts quoted in the work. Part I: The Components of the Coniunctio. The Opposites. The Quaternio and the Mediating Role of Mercurios. The Orphan, the Widow, and the Moon. Alchemy and Manichaeism. Part II: The Paradoxa. The Arcane Substance and the Point. The Scintilla. The Enigma of Bologna. Part III: The Personification of the Opposites. Introduction. Sol. Sulphur. Luna. Sal. Part IV: Rex and Regina. Introduction. Gold and Spirit. The Transformation of the King. The Regeneration of the King. The Dark Side of the King. The King as Anthropos. The Relation of the King-symbol to Consciousness. The Religious Problem of the King's Renewal. Part V: Adam and Eve. Adam as the Arcane Substance. The Statue. Adam as the First Adept. The Polarity of Adam. The "Old Adam". The Transformation. Rotundum, Head, and Brain. Adam as Totality. Part VI: The Conjunction. The Alchemical View of the Union of Opposites. Stages of the Conjunction. The Production of the Quintessence. The Meaning of the Alchemical Procedure. The Psychological Interpretation of the Procedure. Self-knowledge. The Monoculus. The Content and Meaning of the First Two Stages, The Third Stage: The Unis Mundus. The Self and the Bounds of Knowledge. Epilogue. Appendix: Latin and Greek Texts. Bibliography. Index.